Most people tell you they are not creative. Back in May, I tried out a creativity and spirituality festival here at Opawa. We had live music and coffee. We offered kite making and metal tile working, and artists to guide and encourage. The theme was nor’west people – what does it mean for us to be blown by the Spirit. People at Opawa told me they were not creative, but we mounted the tiles together last weekend and this is the result. Not creative my foot! For an article I co-authored with Lynne on creativity as a pathway to spiritual growth, see here. To those who are itching to have a go, “Play!” Get out your wax crayons, your pastels, your paints, your angle grinder and enjoy. Go cook a meal, dig your garden, sing, dance. 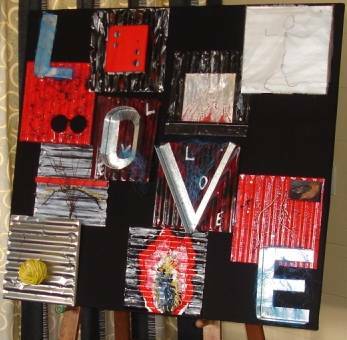 Weld metal, glue stones, take photos, weave grasses, quilt, cross-stitch, make cards. Design websites, write stories, tell stories, arrange flowers. And as you do, be aware of Creator God, who created you. Allow your spiritual journey to come through in what you do, let your work be a prayer, a blessing to others. Enjoy! And to all who have the privilege of seeing someone else’s vulnerable, humble efforts at creativity — treat those efforts as gift, as treasure. Be careful not to inadvertently snuff out the creative confidence of those who would express themselves in this way. Encourage, support, and affirm. Pentecost 2006 is a long weekend. We are already working on a second NorWest Festival. This will include a Spirit art installation, alongside live music and art workshops. Put a ring around it and make plans to have a holiday weekend immersed in Christchurch creativity and Christian spirituality. Absolutely awesome – I love the texture and colour. Love “reaching” down, love at the forefront. Well done everyone. Very creative!